Russia is investigating whether Syrian air space was breached by the Israeli air force, which if confirmed would constitute a serious violation of the United Nation (UN) charter. “If this information is confirmed, then we are dealing with unprovoked attacks on targets on the territory of a sovereign country, which blatantly violates the UN charter and is unacceptable, no matter the motives to justify it,” says a statement from the Russian foreign ministry. At this point there is still a great deal of speculation surrounding the details of the attack and there is no credible confirmation of specific targets and casualties. Vasily Belozerov, the head of the department of political science at the Moscow State Linguistic University and the head of the Association of Military Political Scientists told The BRICS Post that if reports are correct the situation is likely to escalate and tension between the Arab world and Israel will grow. “If the information of the strike is confirmed, that would signal the involvement of another actor into the conflict. Moreover the involvement is present on the side of the armed opposition in an explicitly open form. Up until today the confrontation in Syria was a civil war with the opposition using subversive-terroristic means of fighting,” Belozerov told The BRICS Post. Reports of an attack on a Syrian convoy near a border with Lebanon first appeared on Wednesday – the Lebanese army confirmed the report soon after. Later the Syrian army claimed Israeli aviation targeted a research facility north-west of Damascus, two people died as a result of the strike. The Israeli military and government officials declined to comment. There are rumours of Israel attacking a convoy of trucks shipping heavy weapons to Hezbollah, or chemical weapons, or even targeting the Syrian research centre. 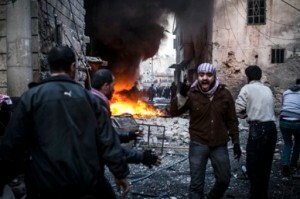 Though irrespective of the details, this incident will likely have an impact on the situation in Syria. “The entry of a third party into the conflict threatens to further internationalise and escalate the conflict and spill over into the region. Consolidation of the Arab world against Israel will rise as well. “As for Russia, the development of the situation along this scenario is quite unfavorable. Along with that Moscow has an additional reasons for examining and promoting its position within UN and other international security organizations, as well as for the support of Damascus by other means,” says Belozerov.